Get Momentum. It’s the small wins that give us confidence for greater achievements. Seek to achieve just three goals every day. These don’t have to be earth-moving, life-changing goals—as you get more wins you’ll start feeling better about yourself and be ready to start working bigger goals. Integrate the Wins into Your Identity. After you get a win, integrate it. This means you should take a moment to appreciate what you’ve done, to give yourself credit, to be thankful for any support you received from others. This won’t happen automatically. You literally need to schedule time each night to reflect on the day, remember the small wins, and feel them. 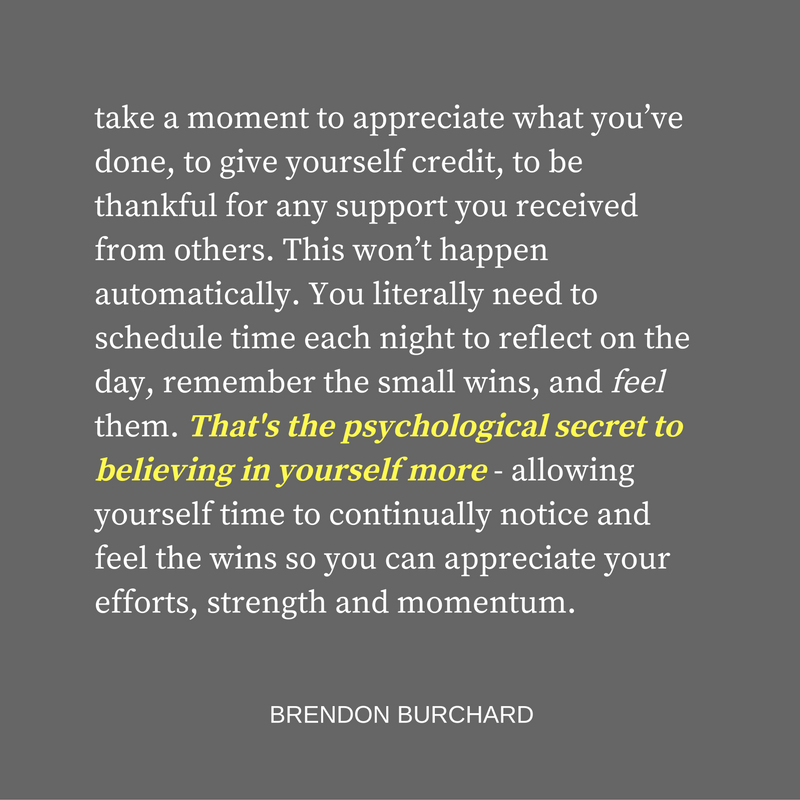 That’s the psychological secret to believing in yourself more – allowing yourself time to continually notice and feel the wins so you can appreciate your efforts, strength and momentum. Get feedback. If you truly doubt yourself, then go ask those you know and trust for some feedback. Ask, “What do you think I’m good at? What do you think makes me a good person? What should I work on to get better?” Their words will inspire or at least direct you. Sometimes we need that outside perspective. Prime the emotions. What do you really want to feel every day? Happiness? Joy? Fun? These emotions can be generated in your mind without any external achievement. Just sit still with your eyes closed and summon the emotions you want to experience. Or read an inspirational passage from your favorite book, speaking aloud with real emotion and power. Try something like these ideas every morning to set yourself up for a great day. Love yourself. You are unique among the seven billion-plus people on this planet. Recognize and honor that uniqueness. You don’t have to make excuses or dismiss your powers or heart. It’s okay to feel pride and love for yourself. Take a moment now and just be grateful for who you are, for your desire to improve, for the blessings of your life and breath. Love that you are alive. Watch the video above for the full lesson so that you can continue living #TheChargedLife! Pssstttt… Brendon is working on his next book, High Performance Habits. Preorder it here on Amazon. Want more training? Join Brendon LIVE at his 4-day seminar called High Performance Academy! Like this episode? Please share it! I can keep this blog and all my podcasts and videos ad-free and sponsor-free ONLY because you share my work! Please share or subscribe to my podcast and YouTube channel too! And I don’t have a pat easy answer for that but I got five ideas here that might just help you. I’m outside here at my writer’s villa in Oregon. I thought, “You know what? Why don’t we just talk about this.” It’s a tough topic but let’s take it on so forgive the sounds of nature if we got them, forget the sounds of anything going by but let’s rock and roll. Number one way to start to believe in yourself is: Momentum. Now I know, off the bat, if you really hate yourself right now. You’re like, “Thanks Brendon, I got no momentum. That’s why I hate myself.” So, hold on. I will get to the mindset stuff. I will get to the emotional stuff. But sometimes, believing in yourself is just tactically winning a little bit each day. If you’re dealing with a difficulty in a relationship, what would be a simple win? A simple moment of appreciation, just something they could say or you could say to put some more pop and energy back into that relationship. Just one smile, one kiss, one good date can change the game for you. Also, if it’s just something simple you can do in your own health. Look, sometimes going to the gym and leaving, you feel a little better. Just a little bit of movement has been proven to change people’s states of minds and their emotions too. So, just get to the gym or get a little bit of small goal setting, getting a little bit of momentum for it in any area of your life, that’s at least a beginning and then, do it again the next day. Don’t just go and crush it tomorrow and then be a jerk and do nothing and watch seven seasons of Netflix on the next day. Momentum is daily. Little things every single day adds up to greatness. And to integrate that win, integrate that success, integrate that moment into their heart, into their identity as a human being, what happens is most of us, we knock off the checklist and did it, did it, did it, did it, did it, did it and five years later after all these did it, did it, did it, did it, made it happen, made it happen, crushed it, crushed it, crushed it, crushed it; five years later, we feel the same about ourselves. The same level of confidence, the same level of belief in ourselves because we didn’t allow those things to enter our psyche, enter our spirit as strength. We didn’t. We took, we had momentum externally but we didn’t have any momentum internally building our character and our strength. We never achieved that sense of pride or ownership of what we did. We didn’t own it. That we did it. So, we never got stronger. That means, you need an integration practice. And just, at the end of the day to allow that to come in. This isn’t about just pepping ourselves up and saying, “I’m awesome. I’m awesome. I’m awesome.” With no evidence. I’m saying, you know we got some momentum. Integrate that now. Own that. You did the work today. You fought the good fight. You finished the day. You’re still alive. You know what you needed to go do tomorrow. Integrate that success. Give yourself that credit. You will develop that strength of spirit that’s so important. And if you do get negative feedback over and over and over, assess, is it real? Do you need to change and shift and get better? And if you do, don’t hate that, don’t get mad at that. Take that as a challenge. Instead of taking things as a insult and crying over people’s comments, go, “Huh, you know what? That’s got some basis in reality. I’m going to take that as a challenge. I’m going to develop myself. Not to prove them wrong but to get better.” Allow yourself that. Allow that feeling to come from the feedback. Next stuff, I love this one, it’s so simple. It’s just priming the emotions that we want to experience in our life. What does that mean? It means, doing something in advance so we can feel it and here is what I mean by that. In the morning, every single day, see I want to be motivated and driven. I want to feel grateful for life. I want to have a sense of passion about the day. But you know what? Some days, I wake up and I feel like crap. So, what am I going to do? Go through the day and just allow my impulsive feelings to tell me to feel like crap all day and lose multiple days. No. I’m going to say, “Okay, I recognize I feel like crap. Why? I didn’t sleep well or why? I got this bad attitude right now. I’m going to change it. In the morning, I do an affirmation practice and visualization practice where what I do is I pick up something; every single morning I do this. I grab a little, just a couple of paragraphs. Maybe I read from my Bible, maybe I read from one of my books or another book. It’s a passage. I have a bunch of passages in my note section of my phone too if I’m on the road and I will just read it out loud, pretending that I’m like in my most passionate, happy place in my life. And I will just get my energy up. Like don’t wait to have good energy in life. Remember, as I always say, the power plant doesn’t have energy. It generates it. You don’t have happiness, you generate it. So, choose to prime the emotions you want to experience in life. Cultivate it. Summon your energy versus hoping a good one lands on you and you will start to feel better about yourself and about life. And the last big one, you knew I was going to go there. Love. You know, you already know a thing about Love Yourself and maybe in some ways, you’ve never allowed that. You’ve never noticed the beautiful things you’ve done in your life. So, you’ve never allowed yourself to love yourself. But at some point, you’ve got to recognize that there’s a love that’s beyond you and beyond me and beyond your actions and that love is whatever bought us here alive today. Some would say, “It’s god’s will and god’s love. For some people it’s the randomness of the universe. Some people it’s nature. Some people it’s whatever. And that aspect of doing that, that brings in so much joy and so much strength in our life is love. Loving ourselves, loving the process and of course the greatest way to believe in ourselves is to love other people that they become so grateful for us that they give us some of that feedback, that there is so much appreciation and love and joy in the moment with others that you can’t help but just feel that vibe that there is an emotional contagion. When other people around you are feeling loved and cared for and excited about life, it’s hard not to rub off on you a little bit and you start to say, “You know what? Life isn’t so bad and you know what? I deserve to feel good here right now too” and you know what? You start to getting some momentums, some wins, you integrate those wins, you get some feedback to get better and all of a sudden, you start to believe in yourself again. All of a sudden you start to live, The Charged Life.